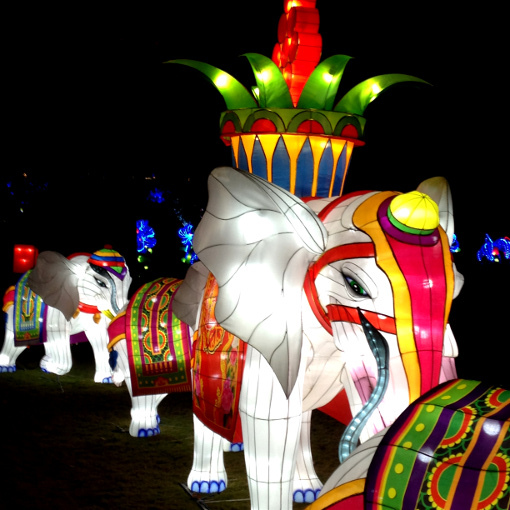 I recently went to the Chinese Lantern Festival with my friend Nikki. It's lighting up Centennial Olympic Park like I've never seen...it's quite spectacular! The 200-foot dragon is particularly amazing. You can see it, too, through Sunday, January 15, 2017! The colors are incredibly vivid and we could not have asked for better weather the night we went! There was a great crowd, but it wasn't at all "too" crowded, and the guests were from all over the country and from all over the world! This is truly an international event! The Festival includes nightly cultural performances at 7:00 p.m. and again at 9:00 p.m., with ample seating. Don't expect a Broadway performance, but I do think the Erhu (Chinese Violin or Chinese Fiddle) portion of the show is exceptional...it's amazing to hear such a wide range of sound coming from an instrument with only two strings! The Erhu performer is also a pop singer and enthusiastically offers a pop song in Chinese, with only two discernible English words..."Oh, baby". He's definitely the star of the show and everyone enjoyed him...even a rather talented dancing toddler who gave his own performance immediately in front of us from one of the side walls where we were sitting. 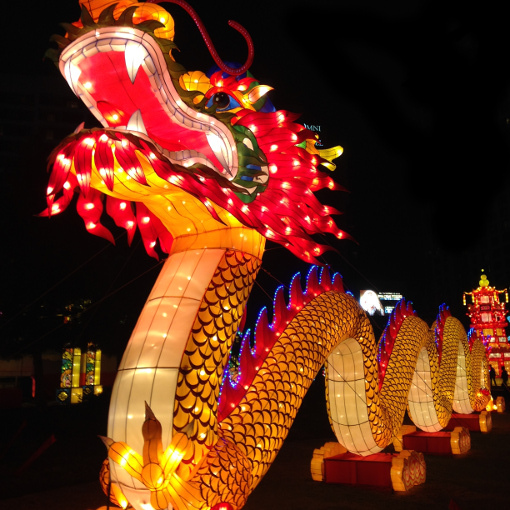 If you've read that there are 25 lanterns at this Chinese Lantern Festival, that's just not true. 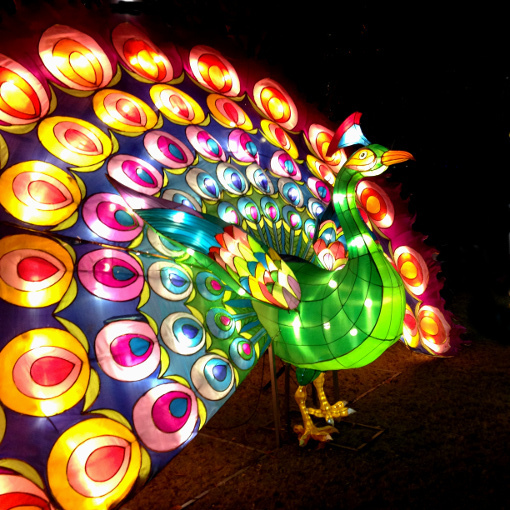 Perhaps there are 25 installations or exhibits, but there are hundreds, if not thousands of individual lanterns! There were parts that we walked through and around a few times...lots to see and from many perspectives. Have fun exploring! 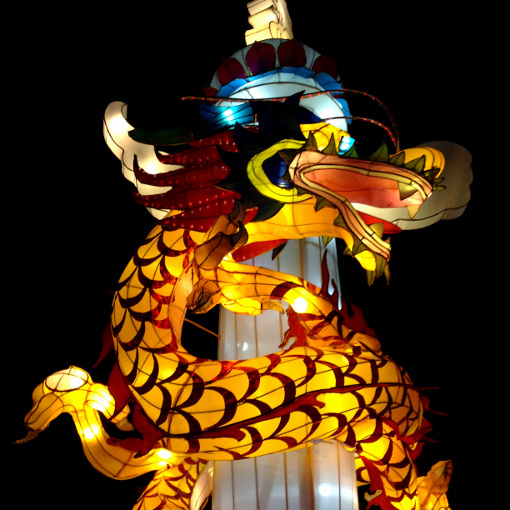 As you explore the lanterns on display, you very quickly realize that they don't all represent China. There may be a tie-in to the country, but I'm not familiar with any windmills in China. Then again, I've never been to China. I personally like this exhibit, tulips being my favorite flower. Also, when I was a kid, my family followed certain Dutch traditions around the holidays...I still have no idea how that got started in my family, but it was fun. And I've always loved windmills. I've not seen many in real life, but was wholly fascinated by the Golden Gate Park Windmill in San Francisco...it's stunning! 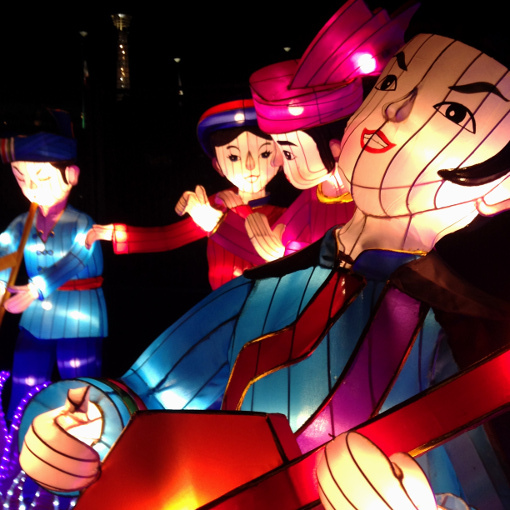 Even some of the musical artists in one of the displays appear to represent various cultures, but of course there are many cultures within China. Imagine trying to select a single American culture to represent the entire country. Would you pick someone from Savannah, the Bronx, Austin, Salt Lake City, Los Angeles or New Orleans? It'd be impossible. Same for China! Native to China, the Giant Panda is a favorite worldwide, and there are lots of them at the Festival! 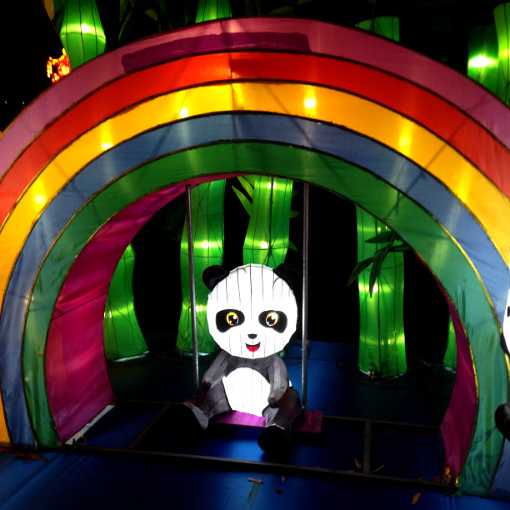 Zoo Atlanta has had quite a lot of Panda excitement this year. In September, twins were born and they received their new names following the traditional 100 Days Celebration. Ya Lun and Xi Lun will be on view to visitors later this month or in January 2017. You can watch the Zoo Atlanta Panda Cam in the meantime! 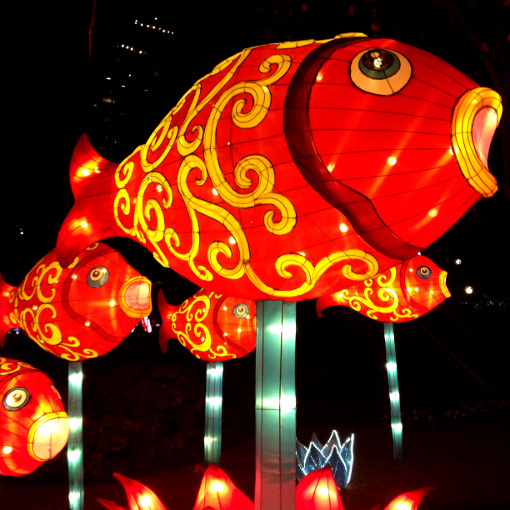 Also important in Chinese culture is the fish and they're well represented at the Festival. I love the ones in the photo above, and there's a "tunnel" featuring fish feeding at the top of a pond...but you're watching from below. It's brilliantly and beautifully designed! Many of the exhibits are animated, either through moving parts or rotating color show displays. This huge peacock is among the most festive! If you didn't eat before you get here, there's food available within the Festival, but I'm not sure if it's Festival specific or one of the regular food vendors in the Park. There is also shopping, live artists who will paint your name in gorgeous calligraphy, and painting demonstrations. For a small space in the Park, they've packed in a lot to experience! 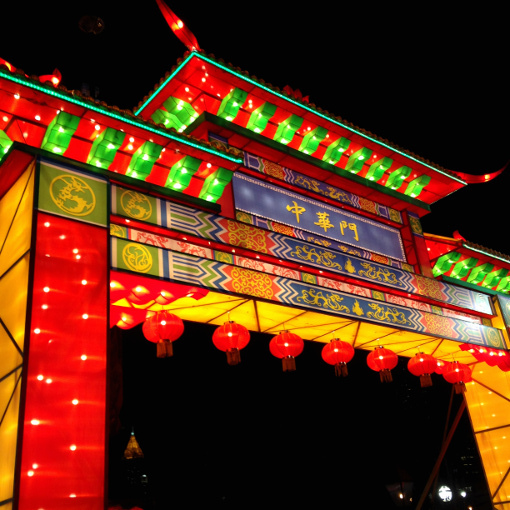 The entrance to the Chinese Lantern Festival is at the corner of Centennial Olympic Drive and Andrew Young International Boulevard. There are separate lines for ticketed guests and guests who need to purchase tickets. Be sure to ask about combo tickets that include ice skating and SkyView Atlanta. But you can save a little money if you buy tickets online. There are multiple, guarded exits from the Festival, granting easy access to other parts of Centennial Olympics Park and nearby attractions and restaurants. 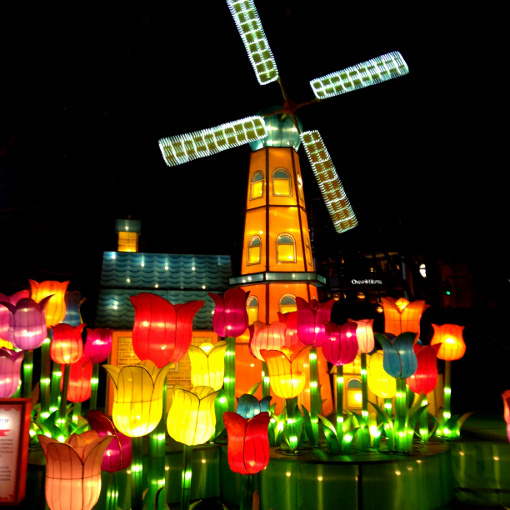 Go, enjoy the lanterns, learn a little history and enjoy a performance. Great review. Was thinking about going...now I will! Thanks for the comment, Dede! It's a fun evening...take your time strolling and enjoy the color! As always, I appreciate your support of "wanderlust ATLANTA", and your friendship! I have to say I absolutely loved going to this place the other night. The people that work there were trying to create an optimal dinner experience while making your choices their priority. I would definitely recommend this event venue for any kind of fancy event.